North Korean soldiers during an annual military parade. One of North Korea's main espionage facilities, located in northern Pyongyang, is growing. North Korea (with their several government agencies and branches of the military) has a long history of espionage and infiltrating South Korea. 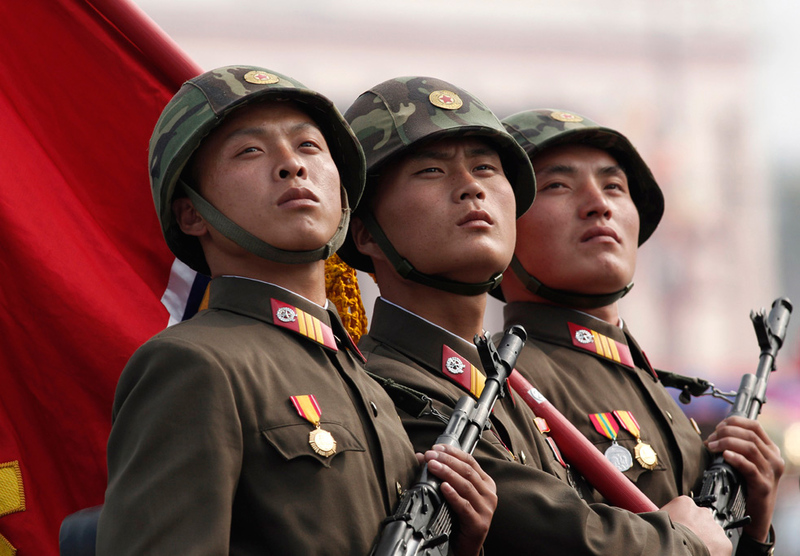 The DPRK also has one of the most active cyber warfare units in the world. Both the military and various agencies have a substantial amount of overlap. According to defector Ahn Myung-jin, one of these facilities (which is near Kim Jong-il Political-Military Academy, also a spy school) is under the Strategic Division of the Central Party Espionage Department. The espionage training annex has a large underground facility with a tunnel 12 meters high, 30 meters wide, and 8 km long. It contains scale models of Seoul, important buildings like the Blue House, and even "functional" areas where officers can get used to going to shopping centers and using currency. The training period within the tunnel can last 15 days to a month each year. As a reminder, clicking on the images will allow you to see larger versions. This Google Earth image shows you the location of the espionage center (top) and surrounding points of interest. Given its association with the Kim Jong-il Political-Military Academy, it is probable that this site is under the control of the General Reconnaissance Bureau, which is in turn controlled by the National Defense Commission (instead of the Korean Worker's Party which has its own intelligence agencies). In this image from 2013, you can see the key areas of the center, including the underground tunnel entrance which also has an insert from another angle to allow you to see the actual opening. The two "areas of interest" are the main sites that will be changing. On Nov. 9, 2015, commercial satellite imagery showed a building undergoing some type of alteration. The building had been emptied and the roof removed. It also shows that a collection of greenhouses near the main gate had been removed. Fast forward to May 2016, and the first building mentioned above has been torn down to its foundations. A new building can be seen under construction as well. The latest freely available commercial imagery is dated April 22, 2017. There is a lot of activity that can be seen. The first buildings pointed out in earlier images are basically completed. However, there is new construction going on in two additional sites, plus a further building being torn down. The entrance gate is also undergoing some kind of an upgrade. These changes will add at least 32,000 square feet (2,972 sq. m) of additional floor space. The site labeled "New Construction Site" is the location of an earlier building that has been demolished. If a new building is constructed and occupies the same footprint, that would modernize a further 39,000 sq. ft (3,623 m) of space. To top it all off, the monuments are being changed, too. As I have written about extensively, monuments to the leaders (as part of the pervasive personality cult) are an integral piece of every military and civilian institution in the country. The original monument was a group of 4 bronze figures, as seen above. The monument has existed since at least 2005. Sets of solar panels are also visible. These panels can first be seen in March 2016. What is interesting is the lack of a central statue of Kim Il Sung (joined by statues of Kim Jong-il after his death in 2011). Nearly every major site in the country has such statues (to go along with murals and other smaller monuments). It appears they've rectified this. On the April 22, 2017 image, the group of statues has been removed and now only spaces for two new ones are visible. This change also suggests, in my opinion, the elevation in importance of this complex. In this image you can also see a close-up of some of the building construction going on. Near the statue place (which is on top of a mound) are piles of construction/landscape materials. The monument mound will be resurfaced with grass and other plants, the stone steps leading up to the statues themselves will be new, and it's likely the whole courtyard will be refaced with new stone. The solar panels have been removed as well. It's probable they were only used to help power necessary construction equipment or needed lighting since a stable supply of electricity is still a problem, even in Pyongyang. There are many examples of military locations being modernized, and various related construction projects are underway all over the country. While specifics are hard to come by for most of these places, what we can learn from satellite imagery is that large sums of money are being poured into defense (from the regular Army and Navy, to the Strategic Missile Forces and covert operations agencies). With this site in particular, we can see that an increased training capacity is being planned (as evidenced by the added square footage) and that the nation's leadership is keeping a close eye on the place, making its importance greater. Why Are in Korea and Why Do We Care?